Berry Islands in the Bahamas is almost synonymous with private islands. Great Stirrup Cay and CocoCay (Little Stirrup Cay), all part of Berry Islands, are owned and used exclusively by leading cruise lines. Great Stirrup Cay, a small island that was once a military base and a satellite tracking station is now a top cruise destination. 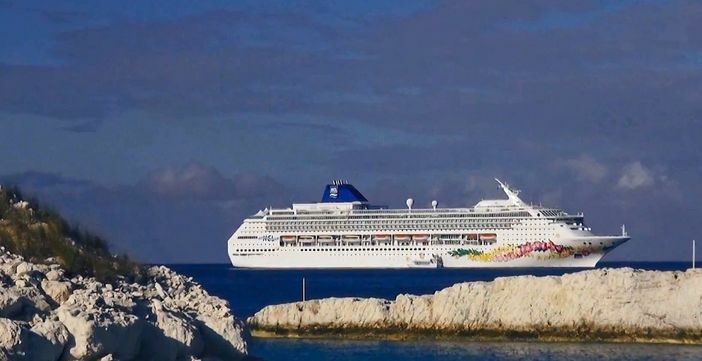 It is owned by Norwegian Cruise Line which uses it exclusively for its passengers on Caribbean cruises. It is an idyllic sun-drenched paradise whose soft and fine white sand beaches welcome your explorer’s zeal. This 250-acre property has been renovated by NCL to reflect the needs of contemporary cruisers. Great Stirrup Cay shares a few common things with other private islands of the Bahamas; it has a lot of activities to occupy passengers. Fun times can range from taking a nap in a hammock tied on the palm trees and swaying to the whims of the breeze or joining in on the many shore excursions like snorkeling, para sailing, kayaking or stingray adventures. Among the things to do in Great Stirrup Cay, a wave runner tour may one of the most exciting. After getting a brief introduction on how to safely operate your wave runner, you get out on the open water and follow your tour guide along the way. Among the tour, visitors can enjoy swimming in the waters at Star Fish Alley, where they can see starfish in the clear waters. More experienced riders can take some freedom to move up front with the tour guide and really enjoy soaring through the waters on their jet skis. If you are a beginner though, do not fret. There is still plenty of fun to be had. 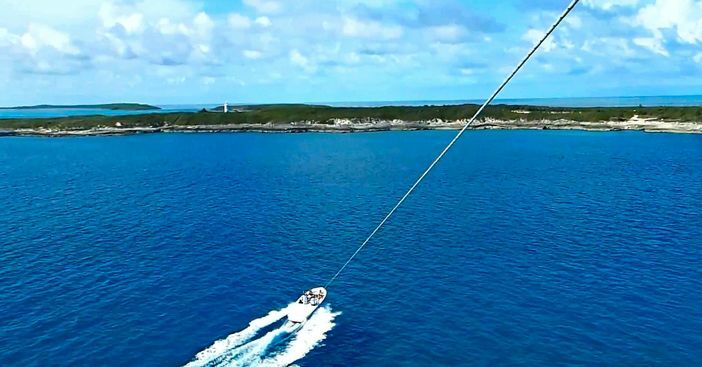 Another one of the most exciting things to do in Great Stirrup Cay is parasailing. There are few experiences that compare to the thrill of sailing through the sky as an experienced guide pulls you along. If you have never been parasailing before, this can be the perfect way to get an experienced guide to show you the ropes. Just jump on board and the ship crew will take care of you. From your vantage point in the sky, you will get to see Great Stirrup Cay in a different light, which can be something worth remembering for years to come. Snorkeling is always a fun way to explore the sea life of an area, so when you are considering things to do in Great Stirrup Cay, it makes sense for snorkeling to be included on that list. The Fate of the Fancy snorkel adventure is fun for the entire family; here you explore the remnants of the “Fancy,” a ship of old that was supposedly attacked by a giant sea monster. Snorkeling takes on a whole new meaning when you go about it in this fashion, and the adventure includes a map to help guide you along the way. The signature cocktail and barbeque taken by the beach side while being calmed by the delightful ocean breezes is a fine way of winding down after taking a swim in the crystal clear waters that are home to schools of tropical fish. The island boasts of the largest water slide where your kids can have the time of their life as you watch. The Hippo Water Slide guarantees to raise your kids’ fun some 40 feet into the air and spread their joys a whole 175 feet which are the dimensions of the facility. The island has three beach bars: one main one and two lesser public houses located on the east end of the beach. A trip to the Great Stirrup Cay is incomplete without a visit to these vibrant bars. 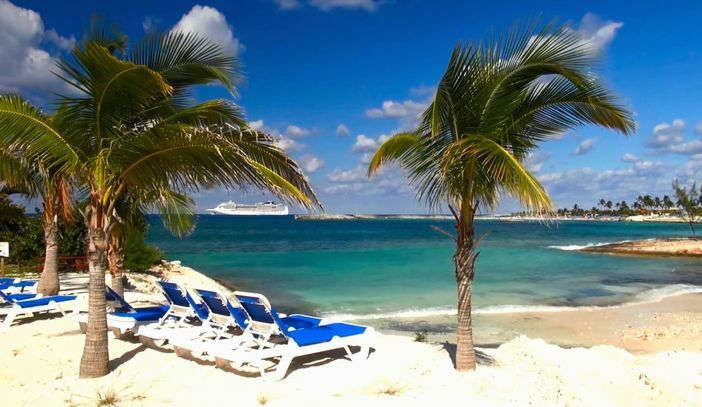 The Great Stirrup Cay weather has a tropical marine climate on an annual basis. The average temperature May through October is mid 80’s to low 90’s Fahrenheit, and November to April has average night low temperatures of mid 60’s and high noon temperatures of mid 70’s Fahrenheit. The average sea temperature from December to April is 77 degrees Fahrenheit and May to November it ranges 81-86 degrees Fahrenheit, with the warmest sea temperature in August with an average of 86 degrees. The highest average daily sunshine hours are 11 in July. The months with the lowest average daily sunshine of 7-8 hours per day are September through February. In December, the average monthly precipitation is 3 inches, and you can expect it to rain approximately 9 days of each month. The months of June to September, you can expect to see 15-19 days of rain per month with an average precipitation of 8.6 inches in July. The dry season is November-April, and the rainy season is May to October with the wettest month being in June and the driest in January. The best time to visit is the high season is December to April. The low season is May to November. The Norwegian Cruise Line has lined up some of their best ships to grant you access to the tropical paradise of Great Stirrup Cay. The Norwegian Pearl will lead this onslaught with three, four, seven and fourteen-day well-planned cruise itineraries. Norwegian Breakaway, Norwegian Gem and Norwegian Sky will also bring guests to this tropical splendor. There are many well-appointed itineraries to choose from, all put together to ensure you enjoy the best of the Bahamas. Go ahead and stake your position in this coming year of tropical fun, book now!